An Apple patent application discovered on Thursday reveals that the company is actively investigating wireless charging for its line of portable devices, but proposes to use the technology in a slightly different way than existing solutions. Wireless charging, also known as inductive charging, has been available on the consumer market for years, promising to replace power cables with a single charging station. Despite attempts from major manufacturers such as Palm and Google, the technology has yet to implemented effectively and is far from ubiquitous. At first blush, Apple's invention, aptly titled "Integrated inductive charging in protective cover," appears to simply be a first-party incarnation of upcoming products that use inductive charging to transfer power to an iOS device. These components usually incorporate an induction coil and transformer that outputs power via a cord plugged into the device's dock connector. 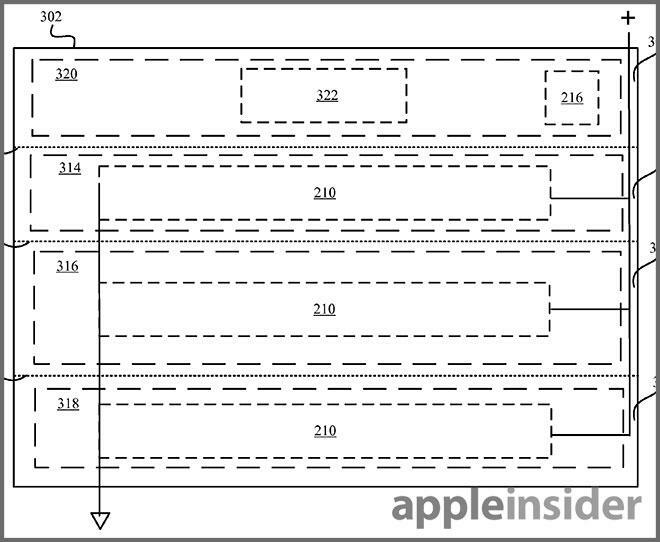 Apple's patent filing describes something different. Top-down view of one patent embodiment showing embedded power transmitters (210) and magnets. The cover has the usual magnetic attachments and embedded Hall Effect sensor that auto-wakes and sleeps an iPad, but instead of the usual layered padding, the segmented body contains battery cells and necessary wireless charging circuitry. In order to facilitate efficient power transfer, the primary induction transmitter and corresponding receiver in the iPad would be placed as close together as possible. 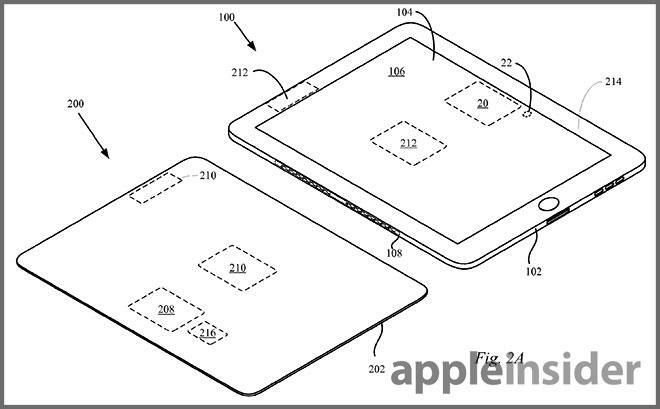 The patent makes use of the Smart Cover's existing magnet tech, which leverages the unique properties of specialized magnets to "automatically" align the cover with the iPad's display. 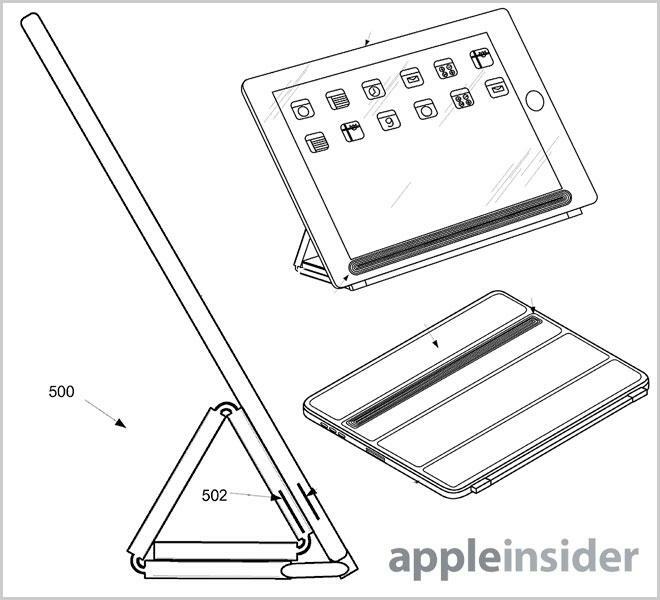 A property previously covered by AppleInsider describes how the installation of magnets, arranged according to a pattern of alternating polarities, within the Smart Cover's hinge mechanism and iPad body makes it virtually impossible to misalign the two assemblies. In some embodiments, the inductive circuit elements can be located in a peripheral region of the flap and corresponding peripheral regions of the tablet device (such as beneath the display mask that borders an active portion of the display). In this way, power can be inductively transmitted between the flap and tablet device in any number of ways and using any number of configurations of inductive power transfer circuits. Charging occurs when the flap is covering the display, thus signaling that the device is not in use. Other embodiments describe methods in which the iPad can determine its own battery state and enable the inductive charging circuit when in "portable mode," or not plugged into a power source. Apple's system is not completely wireless, however, as the cover itself needs to be charged. This is accomplished through a normal AC adapter, though the patent does note that solar cells can be disposed in the outer layers of the cover to harvest ambient energy. Illustration showing inductive transmitter positioning in various modes. It should be noted that current iPads do not contain the inductive charging circuitry required by the patent, possibly hinting that such integrated components are being studied for a future model of the tablet. While it is unclear if future Smart Covers will incorporate the wireless charging technology described above, recent rumors claim Apple is working to release such features in an iteration of the iPhone as early as this year. The company has already shown interest in inductive charging, most recently filing for a patent in November covering near-field magnetic resonance as it applies to a desktop computer setting. Apple's inductive charging cover patent was first filed for in September 2011 and credits Justin Richard Wodrich and Stephen Robert McClure as its inventors.